World music specialist and unique contributor to the drum-set lexicon, Pheeroan akLaff has bolstered many ensembles performing original compositions. 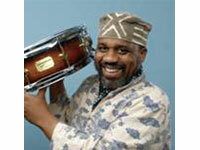 He teaches Jazz, Latin, Funk, Afro Beat and more at Universities and in community service workshops. The craft and personal touch given to Canopus drums allow us to construct the ultimate musical statements. They are tempered to respond to musicians like me who employ a vast dynamic range.